Positive change happens because the current situation isn’t the right place to be or the right way to be going. Change requires not only that you know where you want to go but also to know what it is that you want to change. We can help measure and assess the current situation which then allows for focused, efficient targeting of resources to drive change. A Grain of Sand are keen advocates of triple bottom line thinking, of the environmental, social as well as the financial aspects of any organisation. TBL was coined by John Elkington of Sustainability www.sustainability.com What’s your triple bottom line? During his role as Sustainability Director at the Eden Project Chris Hines led a hands on team which assessed the waste streams by going through every bin bag on site for seven days during peak season. 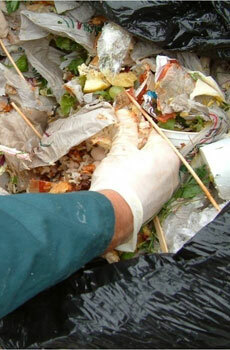 As part of the Waste Neutral Project this helped reduce Eden’s landfill by up to 60%. He also led the measuring of all inputs and outputs of the project working with staff from all teams. Again at the Eden Project Chris Hines helped drive triple bottom line thinking deep into the DNA of the organisation. Using a now infamous PANTS image, Chris co-ran two way engagement sessions with all members of staff across the breadth and depth of the organisation. A Grain of Sand has helped other organisations, ranging from Martinhal, a luxury 5 star resort, to the Angling Trust, establish and develop their triple bottom line thinking. It is important to take stock of where you are on the journey of change and as part of an overall package A Grain of Sand can help facilitate timely reviews. Most things in life are in a constant state of flux and some of the elements and influences on the agenda you are trying to tackle may have changed themselves. “His understanding that words were easy and that the secret of change lay in having measurable criteria against which to monitor improvements saw Eden enter a world of measurements and weighting that has provided the bedrock for our "waste Neutral" programme (a programme in fact developed by Chris himself).” Tim Smit, CEO Eden Project. "Chris is unique. His enthusiasm, practical application and idealism create an unstoppable combination that inspired Eden from its early days to follow a course towards sustainability that was rational, realistic and, ultimately inspirational. His ability to grasp simple communications messages with humour enabled us to embed our "PANTS" criteria for evaluating projects, products and services for their contribution to the triple bottom line into the DNA of the Eden Team.” Tim Smit, CEO Eden Project. Above left: Getting down and dirty, sorting and measuring the Eden Project’s waste streams. 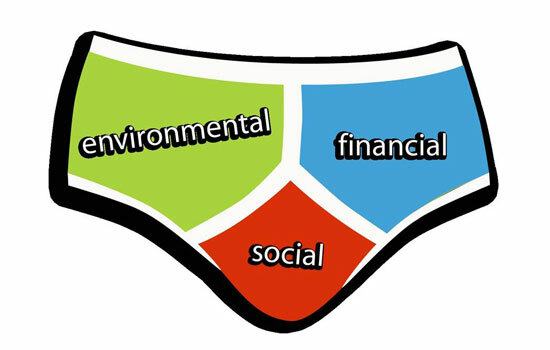 Above right: The iconic PANTs of the triple bottom line.